There are only two events in Berlin each year that can generate enough madness to flood the streets with thousands of party animals and turn the city upside down. Both occur in June. 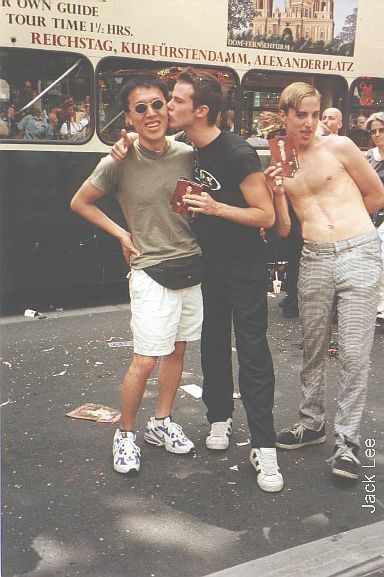 The first one is the Love Parade that pays homage to techno music, which is very big in Europe. I had the chance to witness the mayhem in 1998. Despite claims of something close to one million people at the parade that day, I personally found it quite boring and do not understand what all the hype is about. It is basically packed sardines on the streets bopping to awful loud techno music, downing beers, and turning the parade route into a sewage dump by the next morning. I am not the only person who thinks lowly of the Love Parade by the way :) Many Berliners I know shun away from this annually because it is just too obnoxious. The second notorious event in Berlin is the Christopher Street's Day (CSD) or better known as the gay pride parade by North Americans. Although it is much smaller than the Love Parade, it is by far more flamboyant, shocking, and interesting. The floats are more decorative and orignal instead of some junk yard pieces thrown together by drunks at the last minute. 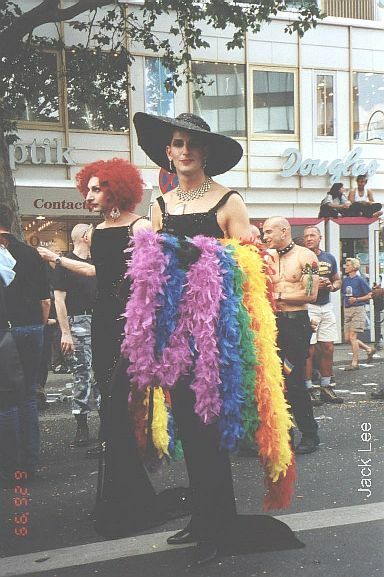 No biases here :) I had the chance to watch the CSD in 1999 after missing it the previous summer due to a weekend trip to Prague. Someone get me a cage to take this animal home!! !